Winter wheat has major environmental benefits. It helps reduce wind and water based soil erosion, out competes many weeds, and generally conserves energy because of the fewer field operations. Experimental winter wheat breeding lines. Despite these and other benefits, spring wheat, and in particular the Canada Western Red Spring (CWRS) class, is Western Canada’s most popular type. World renowned for its excellent milling and baking quality, CWRS often garners a premium price in world markets. Winter wheat is planted in the fall and resumes growth in the spring. As a result, winter wheat is able to take advantage of fall rain and winter snow unlike spring wheat, which is (as the name suggests) planted in the spring. The Canada Western Red Winter (CWRW) wheat class has some inherent advantages that Dr. Robert Graf, Agriculture and Agri-Food Canada (AAFC) research scientist, is particularly interested in building upon. In Western Canada, winter wheat produces about 25 per cent more grain than its spring wheat counterparts. It has exceptional milling characteristics that produce a high percentage of bright white, low ash flour (both desirable qualities in the marketplace), however its baking qualities are not quite as good as those of CWRS, resulting in a lower market price. Graf explains that this project is all about improving returns to the producer by reducing the price difference between the two types of wheat. To close this gap, his goal is to develop winter wheat varieties that incorporate more of the characteristics that bakers and millers look for in premium quality spring wheat. The result will ideally fetch a higher price in the market. “If farmers could capture 25 per cent more yield in a product that gives them a similar return as our Canada Western Red Spring wheat class, they’d be more compelled to grow winter wheat because ultimately it would mean a huge boost in average revenue,” Graf says. To accomplish this, Graf and his team have been working to increase the grain’s protein concentration, gluten strength and flour water absorption. Graf says that one of the major challenges was to find suitable winter wheat parents. Despite looking at germplasm from around the world, “there were no winter wheat lines that combined all of the improvements that we needed,” he says. Graf says that it takes a lot of patience, a good eye, and a bit of luck. 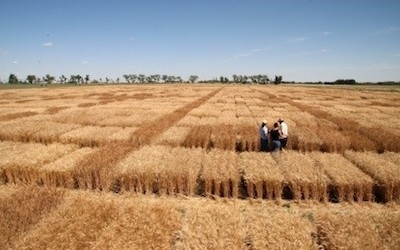 He has studied thousands of experimental wheat lines to find the qualities preferred by everyone from producers to end-processors. Methodically he crossbred these lines to gradually incorporate the desirable traits and develop a select number of parent lines. His team now has its first prototype into registration trials and, while it may not yet be CWRS quality, it demonstrates major progress and is a platform for future advancements. Graf predicts that we could have winter wheat varieties for Western Canada with “CWRS-like” quality within the next decade. Once developed, this improved winter wheat will provide a new option for farmers in Western Canada to increase farm revenue while maintaining Canada’s reputation for wheat quality. A research team in Alberta is working to combine spring wheat’s superior baking and milling characteristics with winter wheat’s higher yield and environmental benefits. When successful, the adoption of this new type of premium quality winter wheat will increase farmer revenue while maintaining premium product quality.